Last edited by Aditya : 20th February 2019 at 12:47. 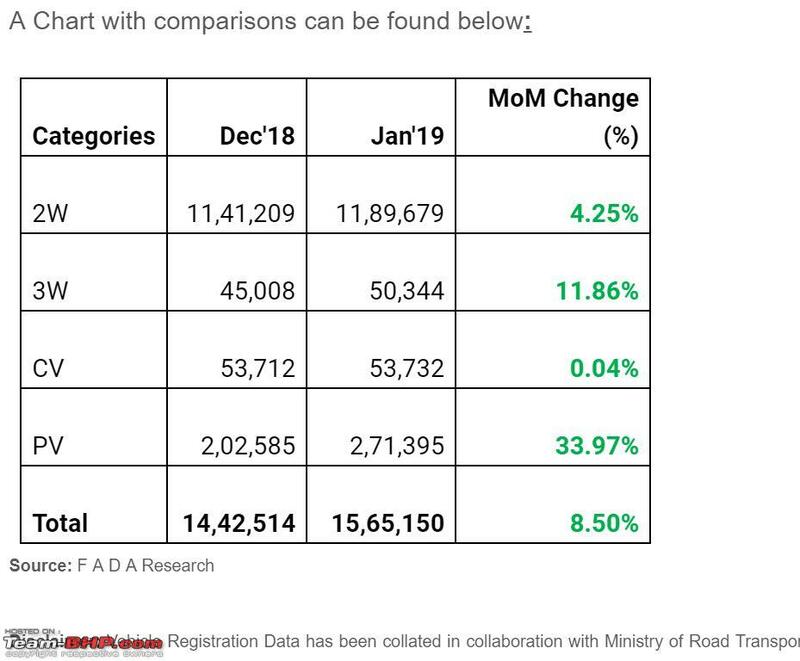 7th January’19, New Delhi: The Federation of Automobile Dealers Associations (F A D A) today released the Monthly Vehicle Registration Data for the month of January’19. Commenting on the January numbers, F A D A President, Mr Ashish Harsharaj Kale said, “As predicted, healthy inquiry levels seen in December finally showed signs of conversions with the Year End offers continuing in January, especially by Passenger Vehicle OEMs which has helped the customer in making the final purchase. Top 4 manufacturers post positive growth. Though Maruti Suzuki shows a near flat growth, it secures comfortably 50 % market share. Tata Motors even with the Harrier launch seems to have been pushed to 5th slot, relinquishing the 4th spot to Honda. 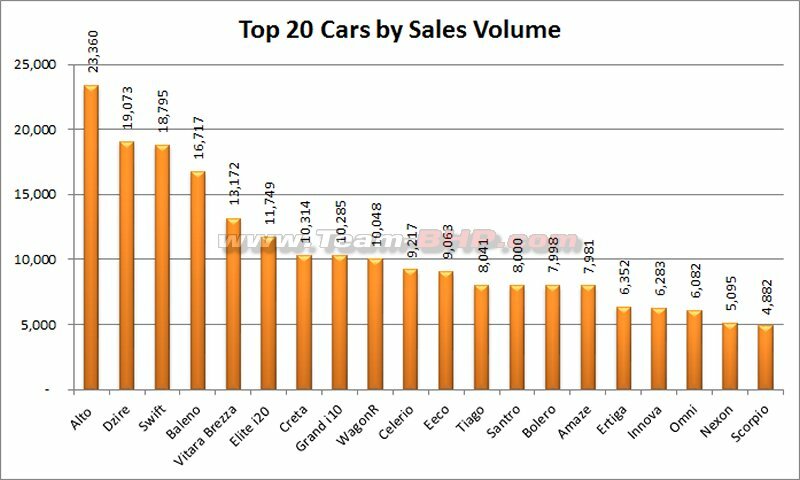 Tata Motors loses the highest in Market share too. 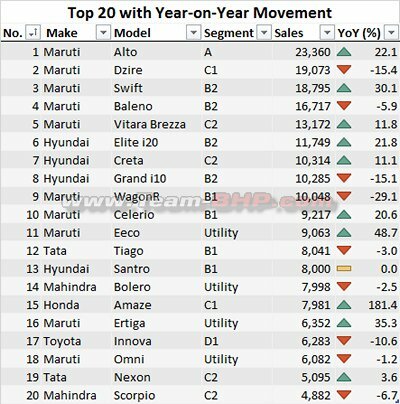 - Maruti Suzuki: Secures its top position in almost all the segments. 7 of its cars are in the top 10. WagonR beats Hyundai’s Santro in the first month itself, after its launch. Maruti was again successful in garnering >50% Market Share. 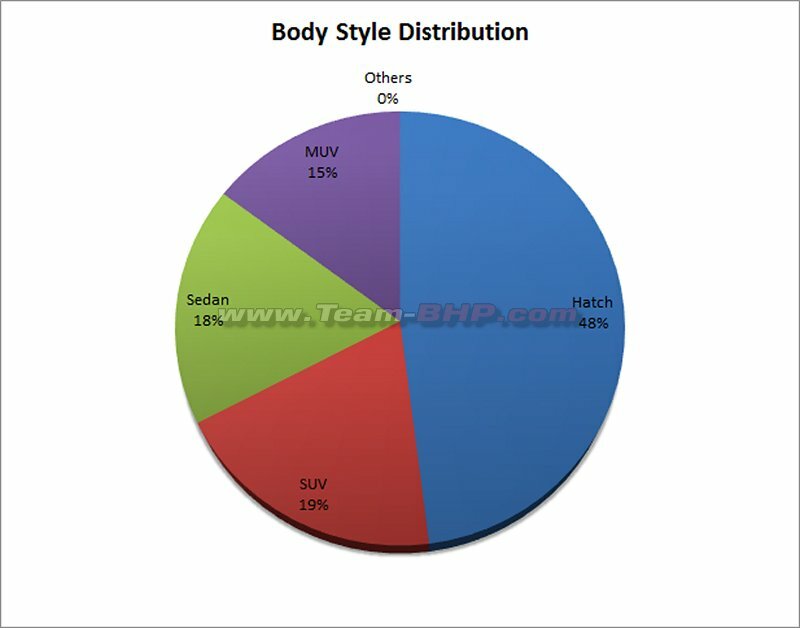 The Market Share has grown by 1% YoY. Ciaz loses out to both Honda City and Hyundai Verna. Not sure if this drop is due to the upcoming New diesel variant of Ciaz. 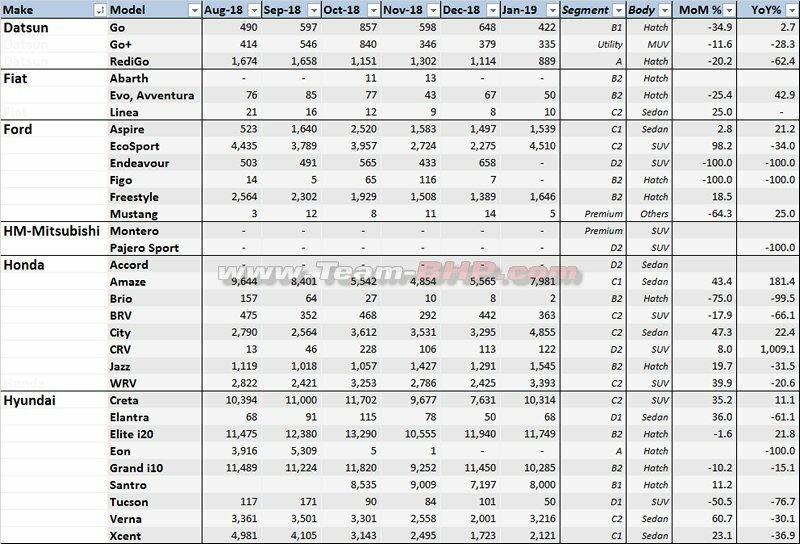 Ertiga leads in the MUV segment. Ignis numbers could be WagonR effect. Ignis production is speculated to have ended and the new updated model is due for launch shortly. Armed with new product launches, power-train changes and face-lifts the automaker is likely to secure its market share as seen today. - Hyundai: Santro launch seem to have not helped in increasing volumes or market share. Will be heavily banking on its C/SUV ( STYX?) and face-lifts ( i10). 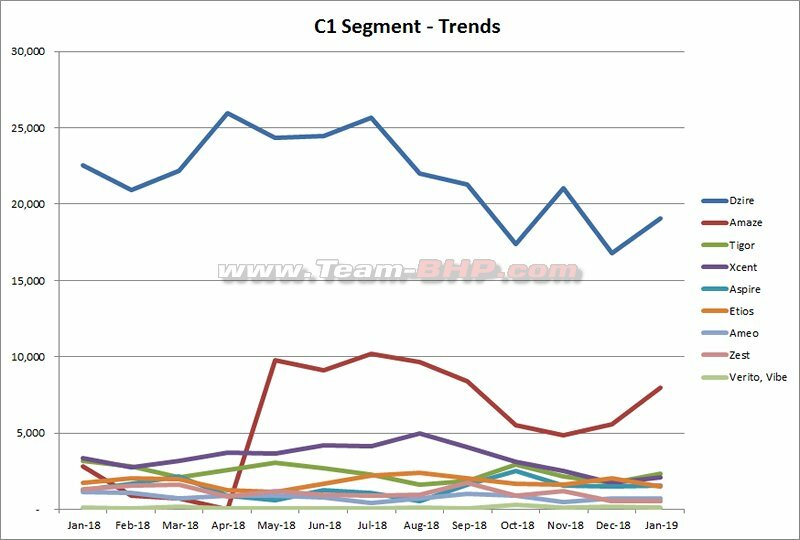 It will be interesting to see markets response to competition in the Creta segment. - Mahindra: Flat growth and stagnant market share need to be addressed. XUV3OO a promising product on paper but needs to await the market response. The Flagship Alturas shows decent numbers but need to see what will be its consolidation numbers a few months down the line. - Honda: Amazing in Growth and Market Share gains. 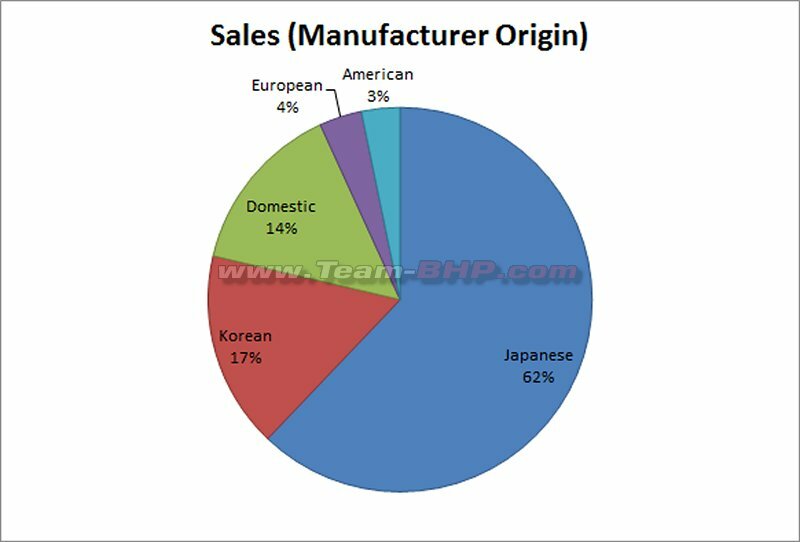 In the process becomes the 4th largest OEM. But the big question is how can it retain this position with no ‘known’ launches in the near future? 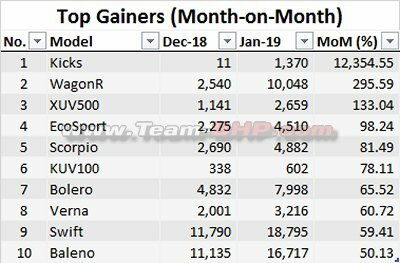 Honda gets back its leading position in the sedan segment after a very long time. - Tata Motors: Loses its position in the rankings to Honda. Not sure of Harrier’s delivery. The volumes looks low when compared to Nissan Kick dispatches. However Nexon and Tiago sell in decent numbers, but overall the group shows negative growth and loses Market share. 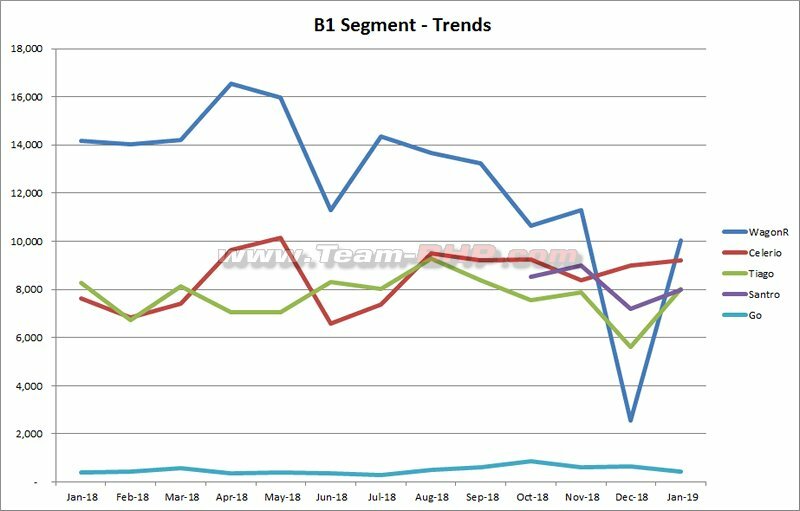 The rest of the automotive group, except Nissan, shows a negative trend in both Growth and Market Share. Last edited by volkman10 : 7th February 2019 at 12:31. 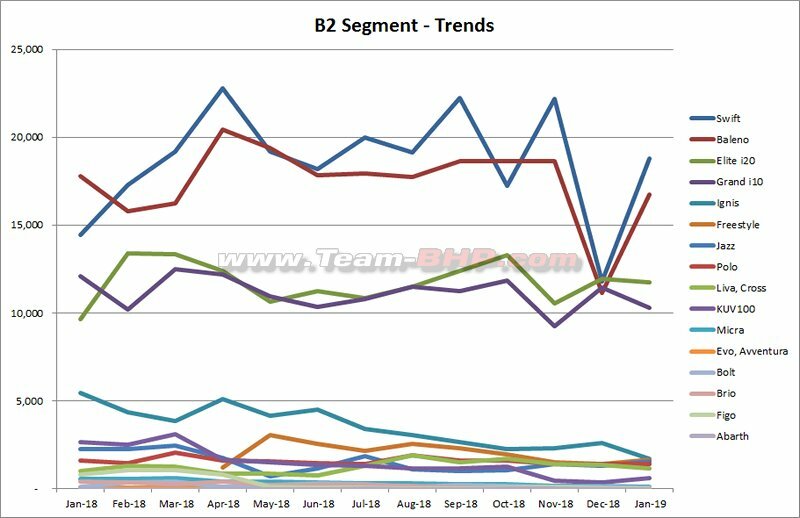 Just noticed that the sales have actually decreased on YOY basis on almost all segments, except the B1 and the utility segments. 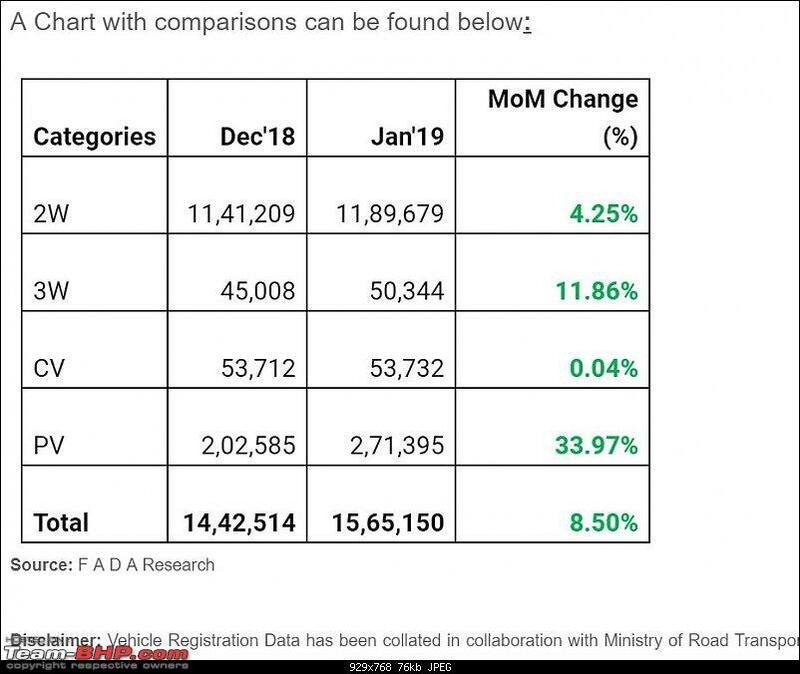 Datsun - sales falling MoM and YoY - the alarm bells should start ringing. Ford - Good month for Ecosport. Has the plug been pulled for the Figo? 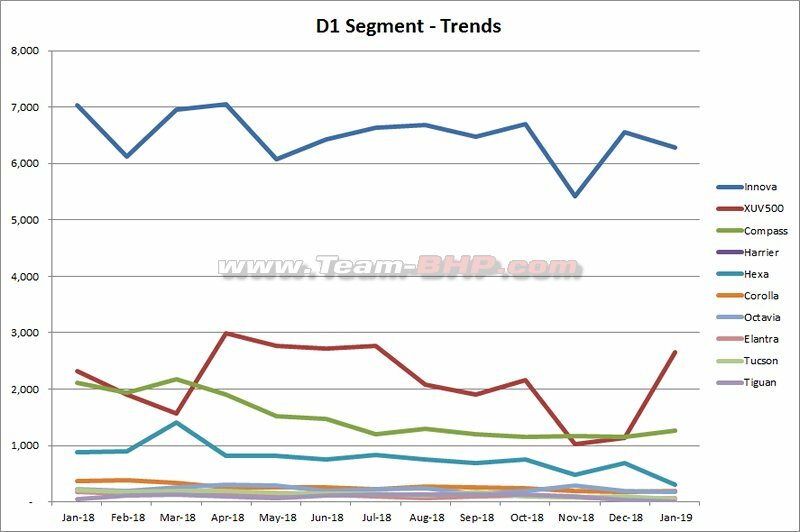 If we consider the Freestyle as the de facto new Figo, it's doing moderately well, but no where near the potential it has with the equipment level. 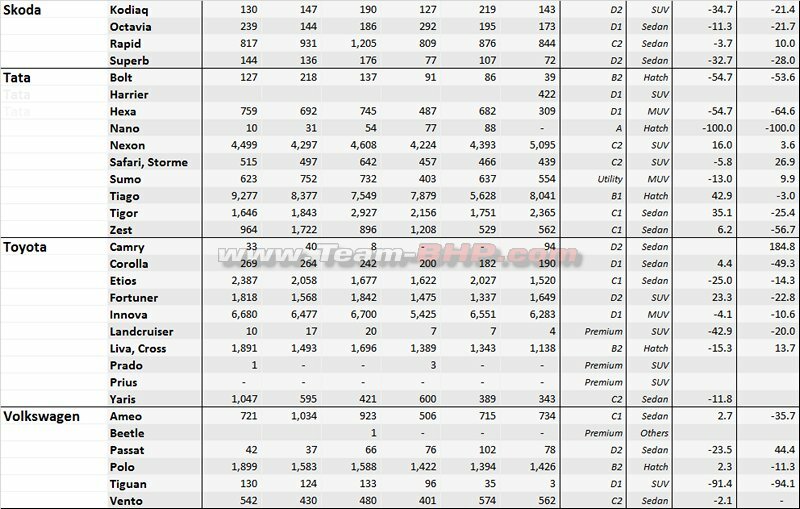 Honda - Amaze, City and WRV sees sizable sales uptick , and carries Honda above Tata on the sales list. 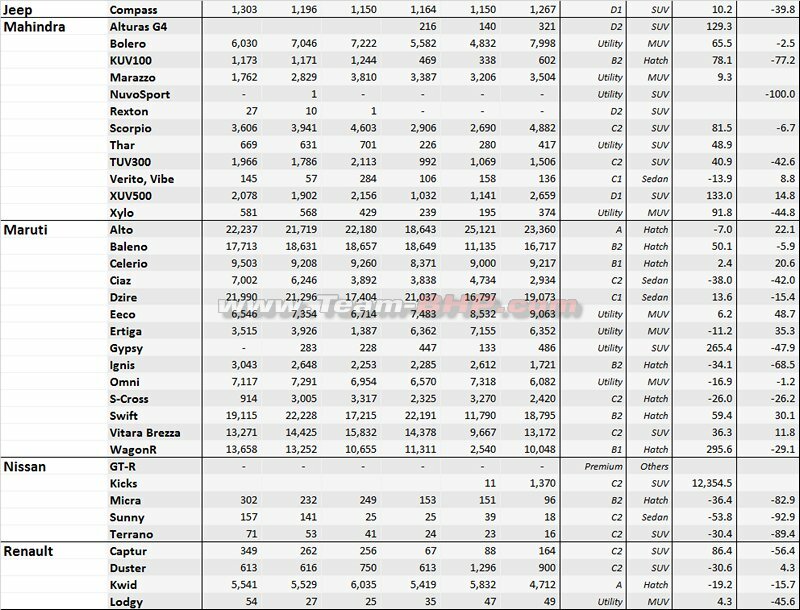 Hyundai - Creta back to 10k+ numbers. I10 and i20 doing good consistently. 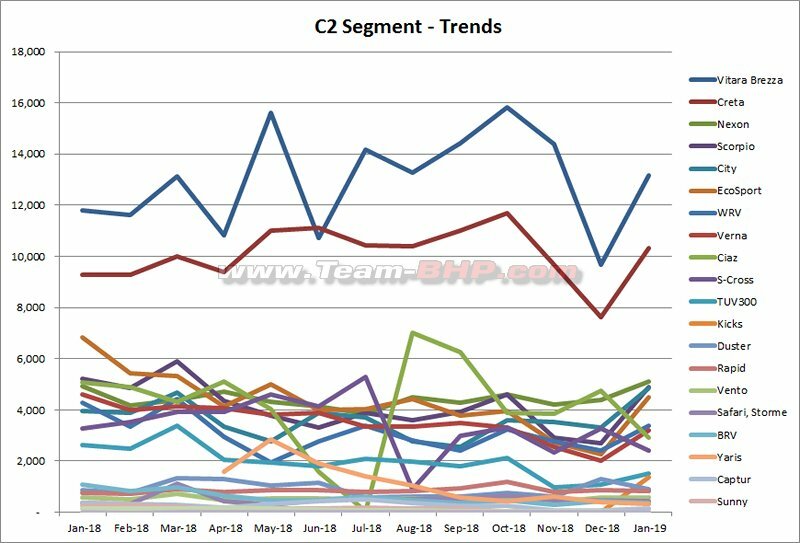 Santro still underperformig IMO, although selling better than Eon. Verna back to 3K+ levels. Mahindra - Bolero, XUV500 & Scorpio sales see a 6 month high. Marazzo doing good too. Maruti - WagonR numbers shoot up. 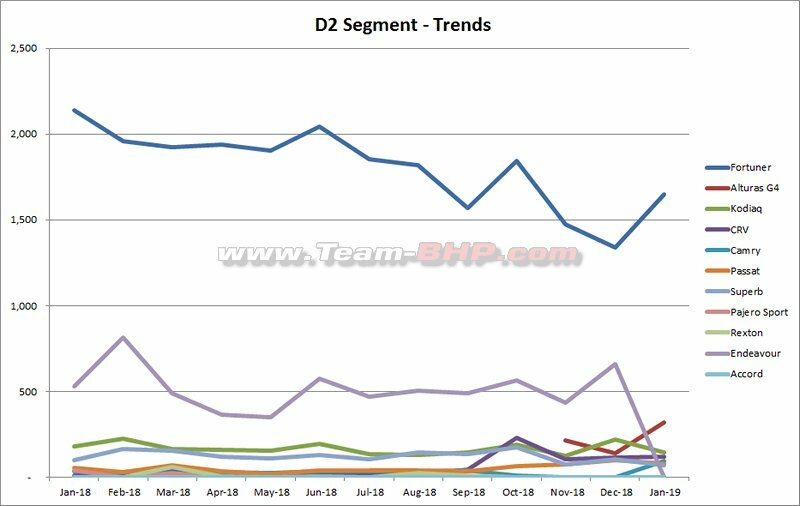 Swift, Baleno, and Dzire sees major sales uptick. Is the Ciaz sales being throttled for any reason? Nissan - Shall Kicks be the shot in the arm that Nissan needed? Renault - How far can a budget hatch pull a brand? Wondering what made Nissan Sunny shifted from C1 sedan to C2 sedan. Ford Endeavour with zero sales / delivery from plant? 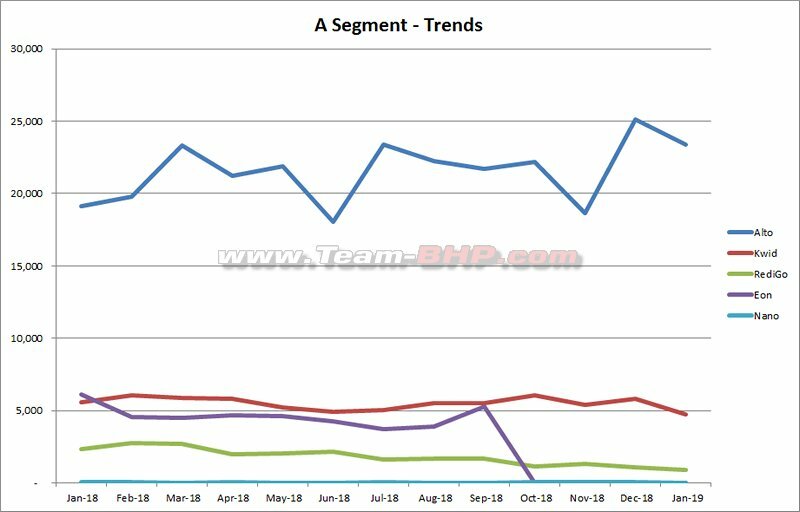 I know its too early, but one thing sticks out - Creta buyers continued to buy Creta (w/ nice uptrend), Compass buyers continued to buy Compass (flat) and XUV 500 buyers doubled their purchase of XUV 500s between Dec 2018 and Jan 2019. However, Tata Hexa buyers moved to the Harrier. Does not look like Harrier stole any business from its competitors. Again, I know its early days. Tata Motors have lost market share, but looking at individual products, loss is mainly due their ageing products like Zest, Bolt etc. The likes of Tiago, Nexon, Tigor have maintained their average sales. Hexa is down though. Surprising to see zero Endeavours shipped in Jan, on the other hand Alturas have managed a healthy 321 sales. Why is Maruti categorized as Japanese? I know it's ambiguous, but it's a listed company on Indian bourses, so can be considered Indian too. Also, no sales of Nano for this month! 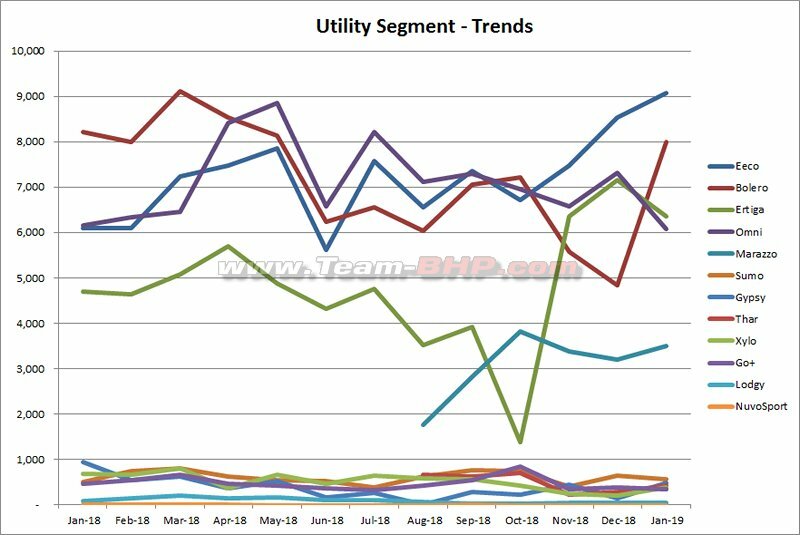 What could be the reason for different months for different sellers ?! 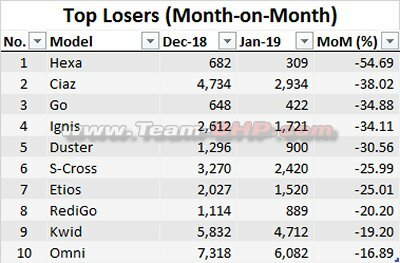 January numbers are always interesting. All 2019 models getting shipped! Hold on a second, Ford did not sell any Endeavours? At all? No XUV300's shipped. I was hoping at least some would have gone to dealerships for display / test drives. Ciaz records one of its lowest numbers. Did somebody mention of a new 1.5L diesel mill? Kicks at 1370? Has it started kicking? Or will it ever! 422 Harriers. Lets hold the verdict for a couple more months. But look what Harrier did to Hexa. 309 units of Hexa, only! Yaris from Toyota sells less than Vento from Volkswagen. That says a lot!